A day like today, when the regulars who usually take charge of the dojo and who play the instruments aren’t here, is a good time for the rest of us to take up the slack, to learn something, to contribute something. And if you’ve been attentive in your zazen, you will have paid attention to the what goes on around you, you will have been sensitive to your surroundings, you will have done more than just sit in your own little universe perched on your zafu. You will have internalized the ceremony, internalized the playing of the instruments, internalized the rhythms of the han, the inkin, the gongs, and the mokugyo. You don’t have to have memorized them, that’s not necessary because they will have become part of your natural rhythm as you enter the dojo. This makes it much easier to step into the role of shusso, inkin player, mokugyo player, or even the godo, the leader. We can learn a lot from the various things we do in the dojo whether it is bowing, sampai, sitting, chanting, playing the instruments. Zazen comes in many forms. When we say that our practice is just sitting, shikantaza, this can be taken as representative of the way we approach a lot of things that we do, especially in the dojo. We often use the word concentration to describe the necessary attention that is paid to each of the wholehearted activities to be learned in the dojo. But concentration is a problematic word because people associate it with the mental focus and effort of studying, but Zen concentration is not anything like studying. Maybe a better word would be absorption. With proper concentration you become absorbed in the action you are performing, no matter how trivial-seeming or momentous. The object of your action becomes an extension of you; you become an extension of the object of your action, like a sponge absorbing water. Properly played, the sound of the mokugyo fills your limbs the way a plant absorbs moisture or nutrients. When you are in tune with your instrument, your body absorbs the tone and vibrations of the gong the way photosynthesis absorbs sunlight. How is this done? Naturally, spontaneously, without thinking, without memorizing, without mental effort. This doesn’t mean that you shouldn’t practice, that you don’t need discipline to make it work, nor that some amount of intelligence or memorization isn’t necessary, especially in the beginning, to make it work. But it can’t be done entirely through mental effort. Study alone won’t take you very far. That’s why we don’t merely memorize the manual on how to do the ceremony, even though we have it written down. We learn by doing with out bodies and minds (or more properly our “body-minds,” through trial and error in the dojo, making mistakes, keeping on going. One of Robert’s early students, who was ordained as one of his early monks and is now a composer in San Francisco, said that when he first went to the dojo in New Orleans, that first morning when he heard the first boom of the taiko drum near the end of zazen, he wondered what sort of person could have made that sound. It was, he said, the most extraordinary and authentic sound he had ever heard, and he had grown up in a musical family. When he discovered that it was Robert, he decided that Robert would be his teacher so that he could discover the source of that sound. Robert is no musician. But in his hands, the hands of a master, the sound of the drum, the gong, or the kyosaku, is always authentic. Essentially, the instruments are very similar. They must all be played with the same attitude, an attitude of mushotoku. Pride in playing them will spoil your tone. Ego in playing them will cause you to make mistakes. You must not hit them timidly because your fear will spoil the tone. You must not hit them proudly because your pride will spoil the tone. You should hit them with respect and compassion—and confidence. When you hit them hard enough but not too hard. the sound will ring true and clear. I can’t describe how it will sound, of course. You know it when you hear it, and you will know it when you hit it. You’ll figure out the way to hold the striker for the gong or the mallet for the han so that the sound is clear and solid, not a dull thud or clang or crack, but a clear, candid, appropriate sound. Each time I start zazen with the three strikes of the small gong it is unique. It doesn’t always sound exactly the same. But you will notice that however the first strike sounds, the other two closely resemble the first. To achieve this you need to pay attention, to be absorbed in the action, not in the performance and its result but in the action itself for its own sake. It’s not about you, it’s not about how well you play, nobody’s going to be impressed. There are no Grammy awards for playing the instruments in the dojo. Take your time, don’t rush through the instrument’s role. It’s like chanting. Chanting is our first lesson in how to play the instruments. Our voices are an instrument, the primal instrument, especially the torso where the chant arises and vibrates like the shapely and sonorous box of a cello. When we chant the Hannya Shingyo we don’t rush through it—there are no prizes for getting to the end before everyone else—we chant it together to get the right rhythm and harmony. Once we have internalized the rhythm, memorizing the syllables—even if we don’t know what they mean—is easy. For any of the instruments to be played correctly, we must understand what they are saying. We don’t need to know the meaning of the syllables of the Hannya Shingyo but we do need to realize that what they are saying is what they are doing: namely, embodying the complex meaning of the Heart Sutra. Meanwhile, the mokugyo keeps time. 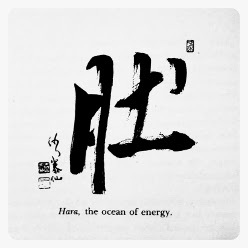 The han, which often has an inscription that says something like “don’t waste time!”, calls us to zazen, urging us to practice right here and now. 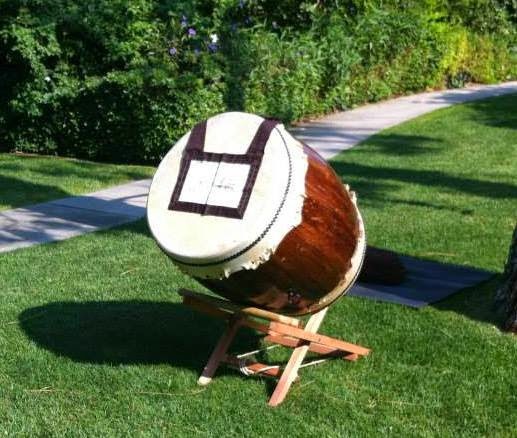 The taiko drum that booms just before the end of zazen marks the hour of day and wakes you up if you’re drowsing. The small and large gongs have the job of announcing the beginnings and endings of zazen and kinhin, as well as providing ceremonial marks of punctuation and emphasis. More complicated is the meaning of the inkin, which seems to be conducting (or protecting) the godo, but is actually being conducted by the godo, who in this way instructs the assembly, through movement and sound, on what to do during the ceremony. People usually start learning the instruments by playing the han and the mokugyo. The three simple accelerations of the han, that block of wood that calls us to zazen, give us time to transition from the world into the dojo. Don’t rush it. Let the discrete strikes breathe, all the way to the end. Find the sweet spot on the wood that produces the right tone. It should not sound hard like a crack, nor soft like a tap. It should have a voice of authority, neither strident nor arrogant, neither timid nor reticent, but clear and confident. This includes the final coda after the three accelerations, which consists of two additional strikes and a third “thunk” on the side or edge of the han. Like the han with its simple accelerations, the mokugyo lets you concentrate on an unchanging melody, setting the tempo of the chanting of the Hannya Shingyo. A blind person can play the mokugyo because you don’t have to follow what everyone else is doing. The rhythm is regular, even monotonous, at least as it is played in our lineage’s dojos, a strike for each syllable or each set so syllables in the Hannya Shingyo. This is fairly easy when we chant the sutra just once, but during the longer ceremony, when we chant it three times, it gets a little harder because you have to increase the tempo the second time around, and then increase it even more with the third repetition. After getting comfortable with playing the mokugyo, you can move on to the inkin. The inkin is very different than the mokugyo because instead of leading the chant, you are being led by the movements of the godo. In effect, the godo is playing the inkin with his body. On the approach to the dojo, he plays it with his walk. As he steps into the dojo, he plays it with his feet. Bowing during sampai, he plays it with his waist, and with his head as it rises from the mat. So it is very important that the inkin player pay attention to the movements of the godo and be sure that the ringing of the bell is synchronized with these movements. A good way to practice playing the inkin is to play godo, going through the motions with your own body, approaching the dojo, stepping into the dojo, bowing after entering the dojo, bowing to the shusso, stepping up to the altar, offering incense, coming around the mat and laying out the zagu, knowing with your body that the last strike of the inkin coincides with the dropping of the edges of the zagu on the mat, and so on through sampai. The instrument that most of us learn to play last is the gong, usually played by the shusso, the head monk or assistant to the godo. A common error in playing the gong is to strike it on top or on the side of the metal instead of at a forty-five degree angle on the edge. Another common error is to strike it too hard. The powerful sound of the gong, one might assume, comes from a powerful hand, but actually the powerful sound of the gong comes from the power of a steady hand. You need not strike the gong any harder than you would tap the skull of a child to get its attention. Then, space the strokes, especially at the beginning of an acceleration, so that you get a good sense of the clarity of sound. Don’t rush it. The acceleration should cut the timing of the strokes almost in half, each time you hit it, a little faster each time, but not so fast that you can’t distinguish the final strikes. The last strikes should remain as clear and distinct as all the others, all the way to the end of the acceleration. Then, after the last strike in the acceleration, let the vibration of the gong die out before you put the period on the acceleration with the pause and then the final strike, which should sound as clear that first one that began the series. There is one more instrument that we don’t always think of as an instrument, but it too is part of the ceremony and we should treat it very much as we treat any other instrument, play it as we play any other instrument. That is the kysosaku. We should treat the kyosaku with the same care that we treat the other instruments, with the absorption of mushotoku. With the strike of the kyosaku on the shoulders, the shusso plays your bodies like an instrument so that you can feel the vibrations that the gong or the mokugyo feels, so that you can resound to the cosmos and identify with the instruments that you play in the ceremony. The kyosaku is the final instrument we learn to play. What makes playing the instruments difficult is if we get too concerned with what we’re doing. We sometimes think that concentrating and being in the moment here and now is concentrating on what we are doing. But being too concerning with what we are doing is not true concentration, not true attention to your environment, not true absorption in your action. The problem only comes if you have not been paying attention until now. You should always be aware of everything that’s going on around you. Someday the other instrument players won’t be here and you’ll need to step up. Someday I won’t be here and someone will need to step up. Same thing in life. In everyday life, at home, in your job, one day everything changes. You have your routine down to a system, everything is going smoothly, and then something happens, something changes, and you have to adjust. You step up. The reason we don’t change the ceremony or the dojo etiquette is so that we can recognize the small changes when they occur, and they always occur. Even when everything looks the same it’s different. We need to appreciate those differences. Playing the instruments is not just some ancient ritual that we perpetuate because it provides some sort of spiritual nonsense. It’s part of the practice, part of the discipline. It’s the way we humble ourselves, not before tradition or religion but before these instruments, before the altar, not because there’s a Buddha on it or because we think we’re Buddhists, but because the altar is there, because the flowers are there, because the kyosaku is there. All of these things we need to take care of just as we need to take care of all beings in our realm of influence. These are some of the beings, however numerous, that we vow to take care of as one of the four bodhisattva vows. These are some of the “all existences” that we are paying respect to when we put our hands together in gassho. So don’t get caught up in your own small and self-centered ideas of what ceremony is, what playing the instruments means, and most of all what the significance of what all these things are. Don’t worry about what concentration is or what absorption is because these are just words pointing at the right attitude which, like the sound of a well-struck gong, you will know when you hear it. Just let yourself relate to the things around you so that you can take care of them in these simple ways, and they’ll take care of you. This is true respect, true compassion. Copyright 2013 by Zen Fellowship of Alexandria. Awesome Inc. theme. Powered by Blogger.